To which I then realized, “Yeah, I do hate when that happens! So what’s stopping me from calling someone and doing a quick 10th step? Why fight through the night trying to go to sleep with that obnoxious feeling in the back of your head? !” So I picked up my phone and texted my support group to see if anyone was available for a quick 10th step. And as usually happens, within 5 seconds someone responded, “I am! Call me.” And I did. And what do you know? It was one of the best calls I’ve ever made! We had a fantastic conversation! I wish I had recorded it. He asked me what I was feeling. What I was going through. What I was thinking. We discovered there was a bunch of stress from a year end performance eval coming up at work and I was worried about what others would think of me (self-centered). I wanted those feelings to just go away (selfish). What my brother in recovery shared with me is that he has learned that he doesn’t like to ask God to take away his troubles any longer, he asks God to help him go through his troubles. And that has made all of the difference for him. He quoted a few scriptures for me (I wish I could remember them) and I started to feel like a million bucks! I felt lifted. I felt loved. I realized that it isn’t really about me when it comes to my review. I’ve done what I can, I’ll leave the rest up to God and any feedback I get will only help me get better at serving my company, serving others, and ultimately being able to serve God. As I was hanging up, he also asked me, “What’s your plan to serve someone tonight?” I was actually going to skip that part (which makes complete sense as I always ask others the same question). But that’s why we have support — we need the help. By him asking me, I thought of others. We came up with a plan that would be helpful to my family and I went and did it. I love my brother for his kind service. It seems like such a simple thing but it may have been the difference between sobriety and not. And I love that! So next time you have the tiniest feeling of being off the path — don’t delay, call someone right away! And that includes your Higher Power! Reach out and ask for help. It can make all of the difference — and it helps the person you call too! Everyone is the better for it. ← Relapse: Loss of sobriety or lesson to learn? 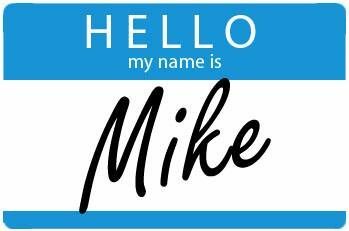 Hey Mike…I can’t believe I just found your blog. I look forward to working backward and catching up on your posts. You’ve got a new follower here. Hi Joshua, welcome! I’m glad you found my blog. If there’s anything you’d like me to write about or any questions I can try to answer, don’t hesitate to ask! Can you drop me an email at jshea.writer@gmail.com — I have something I’d like to ask you off of here. Done. My email is himynameismike.org@gmail.com for anyone else interested as well.